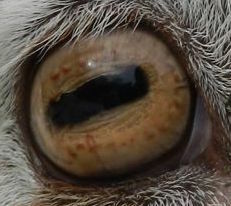 Cuttlefish have a very distinctive and unique “W” shaped pupil in bright light. 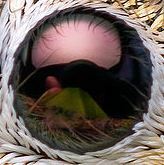 In darkness the pupil becomes circular. 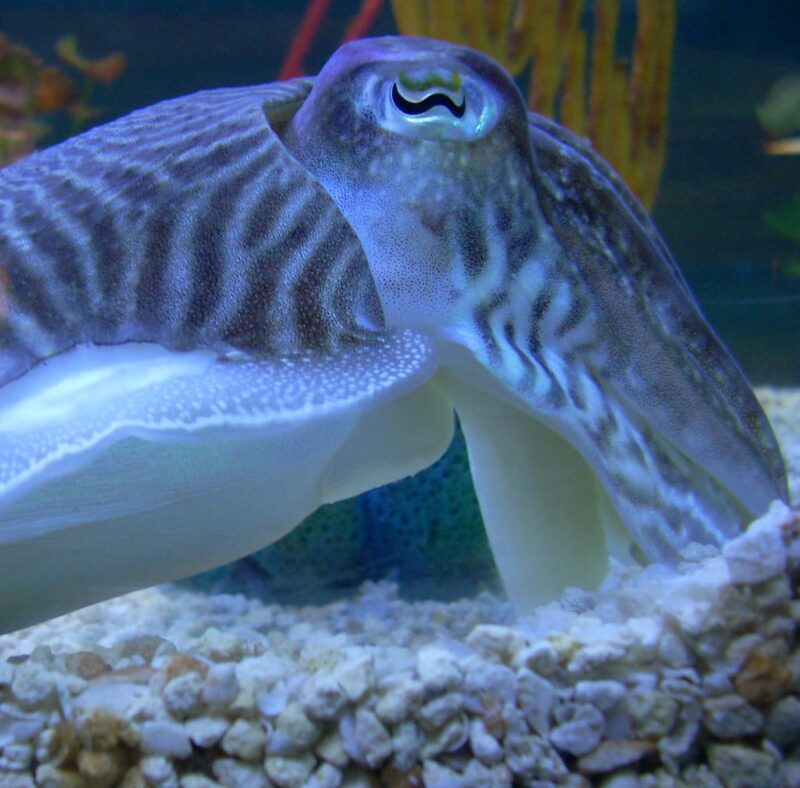 Cuttlefish cannot see colour but instead use the polarisation of light to enhance the contrast of their surroundings. 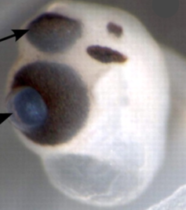 Their eyes are fully developed before birth so they start observing things before they are born! 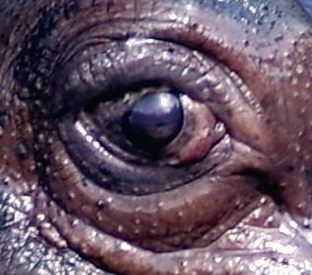 Along with their nostrils and ears, their eyes are located on the top of their heads so that their bodies can be submerged in water but still be aware of their surroundings. 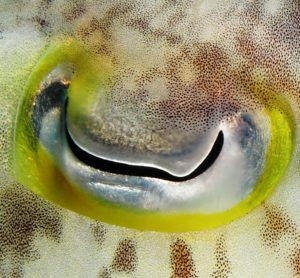 A membrane lies on top of their eyes giving them clear vision underwater – their very own goggles. 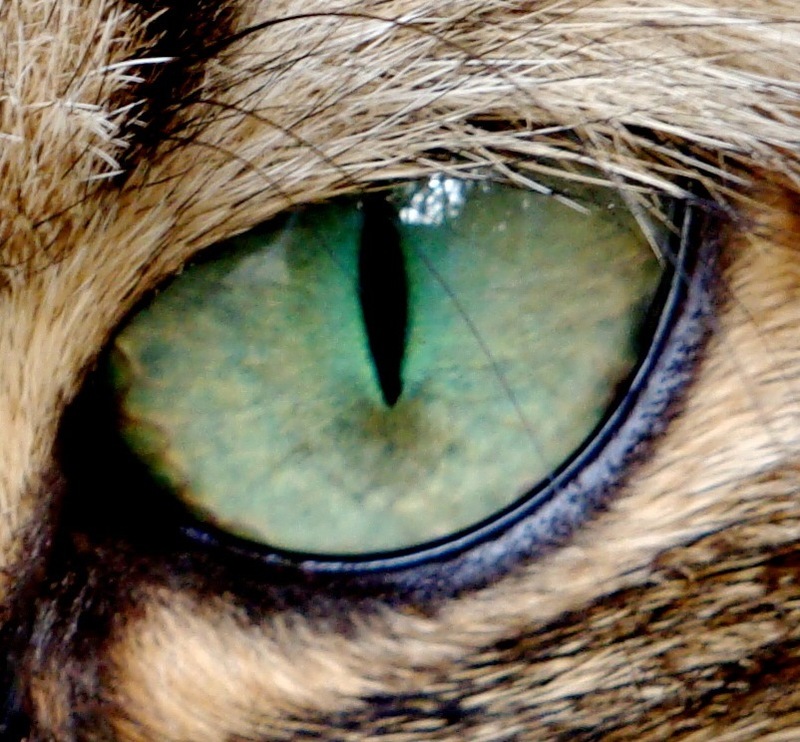 Yes, these are the eyes of your friendly household cat. Ever tried to take a selfie with your cat and you get a bright reflection back?? 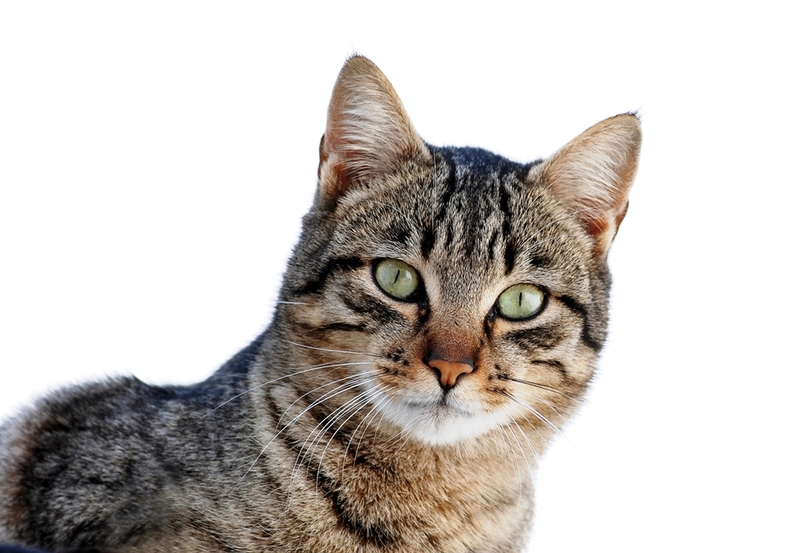 This is because cats have a special layer of tissue at the back of their eyes (behind the retina) acting like a mirror that reflects light backwards. 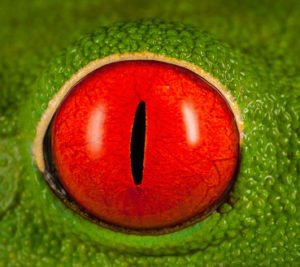 This is called the tapetum lucidum and it is responsible for the superior night vision by increasing the light available to the photoreceptors. 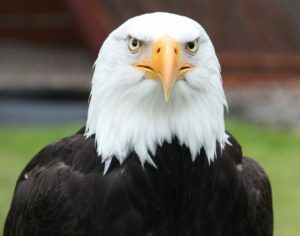 We all know that an eagle’s vision is extremely good – which makes them such good predators – but did you know that an eagle is able to spot a rabbit that is 3.2km away! 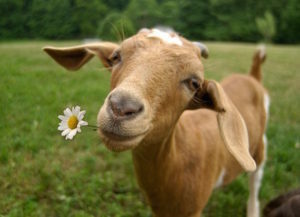 They have 4-8x better vision than humans and the best in the whole of the animal kingdom. 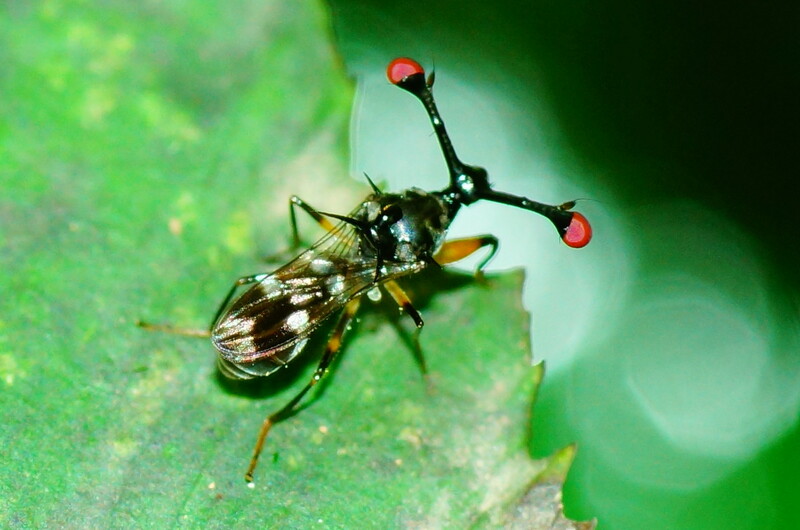 The Stalk eyed fly is a bizzare but interesting species that is predominantly found in South East Asian and African jungles. 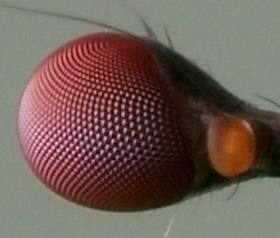 It’s eyes and antennae are located at the end of long projections (hence the name). Males have longer projections that they can actually increase by inhaling air through their mouth. This is one of their mating tricks as females actually prefer males with larger “eye spans.” Size obviously does matter with these flies. 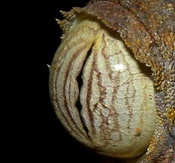 The vertical pupils of Madagascan Leaf Tailed Geckos (Uroplatus phantasticus) contain several pinholes that dilate at night which makes their night vision much better than humans – they are nocturnal after all. They have no eyelids so they use their long tongues to remove anything that gets in their eyes! 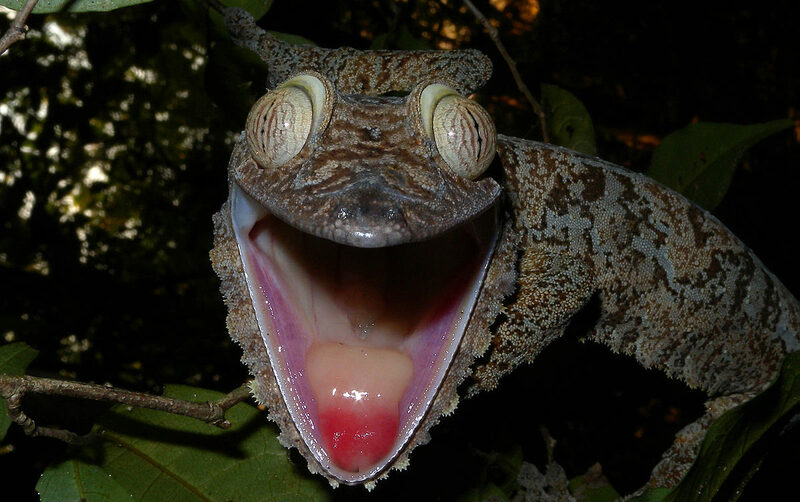 They also open their red mouth to scare of predators. 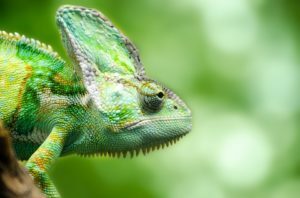 Chameleon eyes have the ability to rotate to see almost 360 degrees around them, moving independently of each other so that they can focus on a moving or suspicious object with one eye whilst still scanning it’s environment with the other. 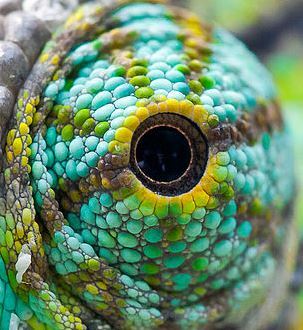 It’s eyelid is allows only a small area of the eye to be exposed. 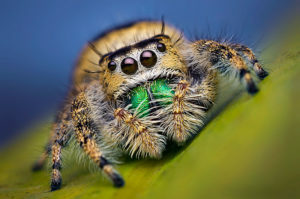 The Jumping Spider (more specifically, the female Phidippus workmani spider). 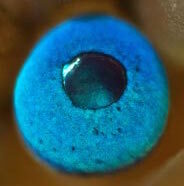 Jumping spiders have 8 characteristic eyes; the four anterior eyes are obvious in the picture and are used for 3D vision for predating it’s prey with extremely high precision. 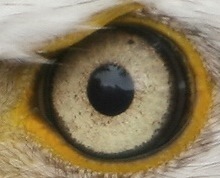 And the posterior 4 eyes are predominantly for lateral vision, particularly to detect motion from prey. 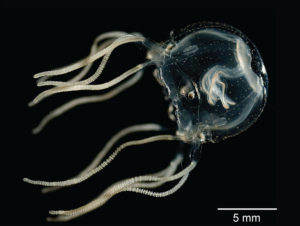 The Box Jellyfish (Tripedalia cystophora) – This is just one eye of it’s 24 eyes!! Not nearly as simple an organism as you may think. 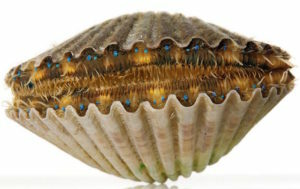 These 24 eyes are separated into 4 sets of 6 eyes – 4 of the 6 eyes in the set are simple light detecting structures whilst the remaining two are able to focus light. 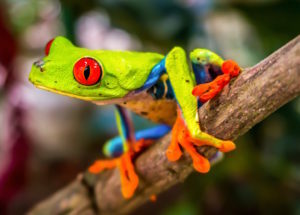 Their eyes help them to determine when they are within the marshy mangrove areas where their food source (small crustaceans) hides, or in bright areas where they risk not being able to eat and survive.